If not properly and well cleaned, mattresses get filled with dirt, dust and allergens that can create a lot of health problems. To maintain the mattresses in your home in healthy condition we offer you our reliable services. 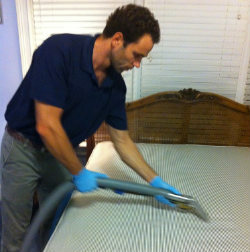 The mattress cleaning which we provide ensures full extraction of bed bugs, allergens, contaminants and dust mites. Spending a third of our lives in bed, it is very important to keep it in sanitised and disinfected. Our mattress cleaning services are provided in and near Blackheath SE3 at affordable prices. There are many parasites which can be found in the bed if it isn’t properly and regularly cleaned. They can cause many health problems. To enjoy a healthy and deep sleep use the mattress cleaning services which we provide to the residents of Blackheath and you will use your mattress longer. Our staff inspect the mattress to see if there are any stains and smells. Then, they vacuum the mattress to gather the visible dirt and spray it with cleaning solution which is left there for 10 to 15 minutes. After that, they apply steam cleaning which ensures deep sanitising and full extraction of all contaminations. After all smells and stains are removed completely, our technicians apply a fabric fresher to finish the cleaning process. Before leaving, they inspect the mattress to check if there is any area that is missed. Mattresses look better, are sanitised thoroughly and will be used longer if you rely on our employees to clean them. Order the mattress cleaning which we offer within SE3 Blackheath to keep your beds healthy and use them many years.